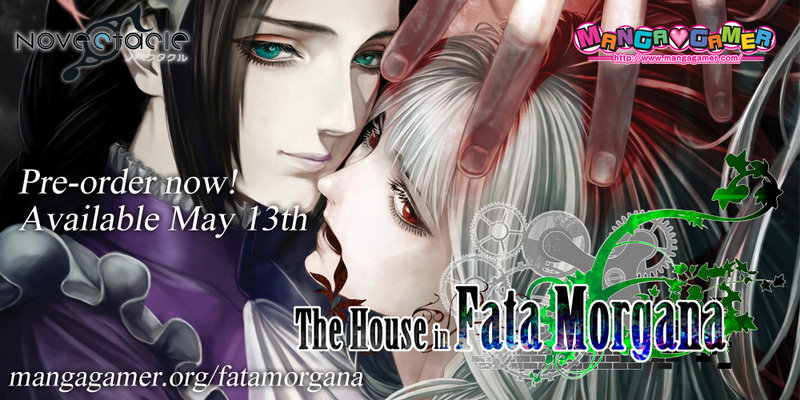 The House in Fata Morgana Now Available for Pre-order! The House in Fata Morgana is now available for pre-order! You can chose from the game alone, the OST, or the deluxe edition with both! The game will be released on Friday, May 13th on both MangaGamer.com and Steam! You can find some more information about the game on our promotional site. We’ll be releasing the demo shortly as well! Hey, everyone, BlackDragonHunt here, the translator/programmer/obsessive nitpicker on The House in Fata Morgana. This being my first (or technically second) official translation project, it’s kind of surreal (and absolutely terrifying) for it to finally have a solid release date. To know that, exactly 43 days from now, this game that’s been my life for more than a year will be out there for all the world to see. To scrutinize. The demo, which we’re releasing soon, contains the first two chapters in their entirety as well as a short, demo-exclusive extra. It’s just a small taste of what The House in Fata Morgana has to offer, but I hope it’s enough to get you interested in picking up the full game when it comes out Friday, May 13th. I look forward to hearing what everyone has to say about the game. Well, however much of it makes its way to this rock I’ll be hiding under for the next six months. Tagged the house in fata morgana. « Tokyo Babel Now On Sale! I also wanted to say that the link to the promo site leads to a blank page. The game looks so good though! Definitely looking forward to it! Looks like they forgot the : after http. When I typed that in, it went to the right page. I’ll be picking the game+OST, those samples sold me on the OST. Though I’ll have to wait for the day of release since I’ll be going with the Steam version and that doesn’t look like it’ll have preorders. Is this going to have Steam trading cards? Only one day earlier than my birthday.